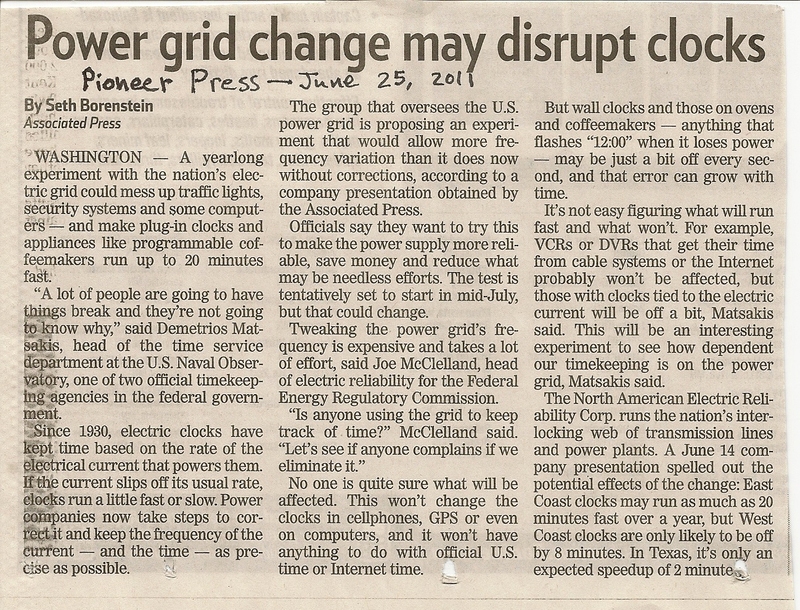 This article says that the regulations on the nation's power grid will be loosened in terms of the accuracy of it's "rate of current/frequency." I suppose it means the 60Hz frequency at which the AC current switches. They will try this for one year, and the idea is that it will cost less, be easier to be more reliable, and possibly not as unnecessary. 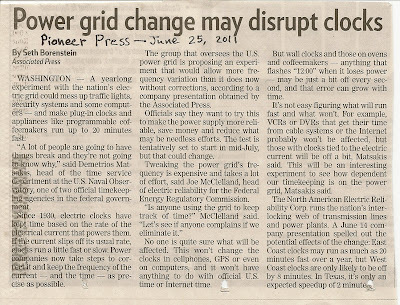 However, they will try to see if this affects clocks that are powered and regulated by the grid, i.e. that you plug into a wall outlet. I didn't know this, but these types of clocks (apparently) rely on the regular frequency of AC current to regulate time. I found that interesting; I thought they would all be regulated by crystal chips or something electronic like that. So at the end of the year, the clocks may run up to 20 minutes fast. Officials are going to see if this actually happens in massive amounts or if it doesn't really matter. Personally, I think that over a year's time we wouldn't notice. We would just adjust the time of the clock every so often. But, with the maximum estimation of 20 minutes off, and assuming you would adjust the clock if it was off by 2 minutes, you'd adjust the clock 10 times a year. That's almost once a month, so maybe that would be bothersome.